A very smoothly written, disturbing book, about a private detective who battles constantly with severe pain and heroin addiction while trying to earn a pittance of a living and solve crimes for her clients. Admittedly, not the happiest of books, but who likes happy anyway? 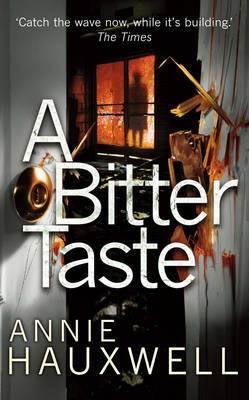 A BITTER TASTE is the second book by Annie Hauxwell to feature her haunted PI, Catherine Berlin, and is absolutely fantastic. It is so well written that you can smell the fear of the homeless people that Catherine meets and almost taste the desperation of the mother whose child has run away. A truly beautifully written piece of work. Catherine, or Berlin as she now calls herself, is trying to cut down her heroin usage and get her addiction under control. Or, rather, her doctor is. Her pain levels become unbearable and she hobbles along on her injured foot, constantly reminded of the incident that nearly cost her her life. Times are hard and she is reduced to helping a shopkeeper who suspects his wife of infidelity in return for basic food items from his shop. Then an old acquaintance comes back into her life, with the shocking tale of her daughter running away and her husband being murdered. Berlin initially does not want to help her and tells her to go to the police but over time gets drawn into the case and sets out to do what she can. What she uncovers is truly shocking and has her becoming protected as an official police witness at the same time as being wanted for a murder that she didn't commit. It doesn't seem as if there is much of a way out and you are left on the edge of your seat wondering what will happen next. I loved this book. It took me a while to get completely into it but it was worth sticking with as, by the end, I couldn't put it down. If you like dark crime that isn't too gory but messes with your head anyway then this one is most definitely for you!